Are Gluten Free Probiotic Supplements Enough to Keep Your Gut Healthy? People following a gluten-free diet often look for gluten free probiotic supplements to keep their digestive tract healthy. Is taking such a supplement enough to make up for the impact of gluten-free diet on digestive health? There may be other factors that you may need to know if you are one of those asking these questions. People who follow a gluten-free diet are either doing so by choice or are forced to do so because of their health conditions. Gluten is a protein commonly found in rye, wheat, barley and other types of grains. Those who suffer from Celiac disease, or an abnormal reaction to gluten, do not really have much choice but to do without gluten. Meanwhile, others have allergies or negative reactions to gluten, hence the need for them to follow a gluten-free diet. For others who do not have these conditions, the choice is voluntary, with most of them going gluten-free because they want to lose weight or because they believe that doing without gluten will give them more energy and stamina. According to a study from the Spanish National Research Council, a gluten-free diet may result in diminishing the levels of Lactobacillus and Bifidobacterium in the stomach. This is not a good development since both bacteria are necessary to maintain a healthy digestive system. In addition, some gluten-free dieters have reportedly shown weaker immune health. Because of this, those who follow this type of diet program often look to gluten free probiotic supplements to fill the gap in their gut. In short, they try to boost their digestive health, affected by the lack of gluten, by taking probiotic supplements. This sounds logical since probiotics are supposed to enhance the good bacteria in the gut which are necessary to maintain a healthy digestive tract. But is this enough? Probiotics can definitely help keep the digestive tract in good condition, but there have been studies claiming that the efficacy of these live microorganisms are diminished once they have undergone manufacturing procedures. There have also been studies stating that whatever benefits probiotics provide to the digestive tract can be considered minimal. This is where prebiotics come in. These food ingredients’ primary function is to feed the good bacteria already present in the stomach. They stimulate the growth and activity of these good bacteria which can lead to better digestive health. Regardless of whether a person is taking probiotic supplements or not, prebiotics can perform their work since there are already good bacteria in our gut to begin with. There have been some research efforts claiming that probiotics actually do not work as well as they should unless prebiotics are also added into the mix. For those people who, for one reason or another, are unable to consume gluten, prebiotics may be the answer to their digestive health concerns. If certain research studies are to be believed, a gluten-free diet is not exactly good for the digestive health. However, this does not mean that followers of this diet program need to abandon their dietary habits. Supplementing with prebiotics may be the answer to their digestive health questions. For these dieters, Kiwi Klenz is one option they can explore. 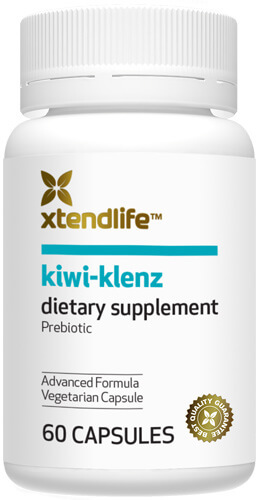 This prebiotic nutritional supplement is made from kiwi fruit and contains phenolics, enzymes and soluble fibers which create a well-balanced formula that helps keep the gut healthy and protected from bad bacteria. It is made from all-natural ingredients so there is no worry in terms of adverse reactions. Gluten free probiotic supplements may be good for those following a gluten-free diet. However, if they want optimal gut health and a safe way to compensate for the absence of gluten in their diets, a prebiotic supplement like Kiwi-Klenz may be the best option.